Myth Racing Components was started as the need for assembly tools became apparent through conversations with other early hemi owners. 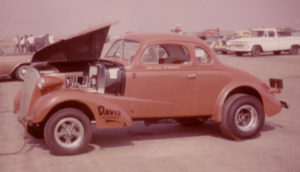 The name “Myth” came from my BB/GS ’48 Austin “The Myth” which I raced in the ‘70’s. In most cases I have taken my own tools (primitive in respect to the tools offered on this site) and refined them to produce a quality “tool room” product. As noted on some of the product pages, a check of numerous “stock” as well as aftermarket engine components indicates some variance in machining tolerances. For example, a .003-.005 difference was found in the spacing of head bolt locations from block to block. This may not seem like much but it makes the machining of a “tool” difficult. The kits supplied on this site have instructions included with the kit that alerts consumers of these variances and what to do to provide the most accurate setup. Please take the time to read the following “About Me”. In addition, a “Tech Talk” section has been included which covers most of the components in the engine assembly as well as some tuning information. Please note: This is what works for me (and has been working for 40+ years). It is not a guarantee! If you have questions, do not hesitate to give me a call or drop me an email. I would rather you ask a question than to learn the hard way (like I did). I started hopping-up my ’57 Chevy street car after I got out of high school in 1960. I added a stroker kit with 12:1 pistons and Engle cam to produce a whopping 341 ci. In 1962 I went to work for Douglas Aircraft Co. in the machine shop where I ran their first 4-axis Numerically Controlled (now CNC) machine. 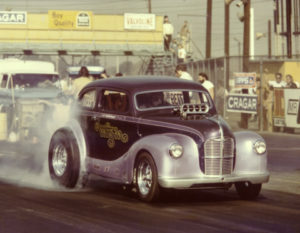 Shortly thereafter I broke the crank in my Chevy so opted to sell the car with a stock engine and put my repaired 341” in a ’37 Chevy for drag racing. With a little extra cash from working seven days a week I purchased Hilborn injectors, an Engle roller cam, Vertex magneto and some ported heads. This heavyweight ran 12.30’s at Lions. After breaking yet another “welded” stroker I purchased a destroked 265” Bonneville short block (258”) with a chrome crank and one bad throw for $25. Crankshaft Company repaired the throw and afterwards warned me I would have very little clearance. Upon checking I found the clearances were about .0002 – .0005! Since I was out of “mad money” I assembled the engine, put in my 6.14 gears and headed for the track. This combo ran 11.72 @ 116 mph ??? I never had any bearing problems. In ’69 I traded the ’37 Chevy for a ’48 Austin of England. Some work had been done on the stock chassis but that was it. 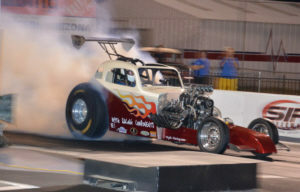 I learned that Fred Seay (Donovan Engineering) was selling the supercharged 331” hemi out of his dragster and decided that was exactly what my Austin needed. Also in ’69 I was recruited by the N/C programming department (by now McDonnell Douglas) to make the switch to a programmer rather than a machine operator. One of my first assignments (paired with an experienced programmer) was the first machined part on the DC10 which was the front window frame for the cockpit. Along with the new job came some additional pay along with a 68-hour work week. I now had a little extra to spend on the car but even less time to spend on the construction. In summer of ’72 the car was completed and I made the first runs at Lions with the BB/GS Austin which netted et’s in the high-nines. With no experience running a supercharged engine I soon found how easy it was to knock out pistons and rings. After a lot of pistons and tuning changes I was finally able to run in the low nines at speeds around 150 mph. By the mid-‘70’s I had replaced the B&M Clutchflite with a B&J 3-speed, acquired some good heads from Steve Woods and more or less cured the burned piston/ring problem (more on that in the Tech Talk section). With a .060 over 354 @ 2950 lbs (legal BB/GS), I eventually ran 8.57 @ 162 mph. This was accomplished with 14-32×15 tires, 5.57 gears and a launch rpm of 9000+ (peg the tach. and slide your foot off the clutch). FYI: I ran a 40 lb. flywheel and a 10” McLeod “Long” dual disc setup with 800 lbs. of static spring pressure. As you will see, “Tech” is a pretty loose term but we had to call it something – getting a hemi to run isn’t rocket science. I never broke any rotating parts running at over 9000 rpm. One reason I could do this was the light piston/rod assembly associated with a supercharged gas motor. By the late ‘70’s the Austin was long gone but the engine sat on an engine stand in my shop as a reminder to someday find it a new home. The “someday” took a while since I was now the manager of the Boeing parts programming group in Huntington Beach, CA. As with these types of jobs and especially corporations like Boeing, you don’t stray far from home – work is your life. Early retirement in 2000, five years taking care of my mother and relocating to Prescott, AZ brings us to 2008. My cousin lives in Phoenix and asked me to look at a 6.00 certified Spitzer Fiat Topolino altered. He was looking to upgrade but decided not to buy this car. The light bulb goes off, mama approves and I’m back in business. I refreshed (as best I could without buying everything new) the same tired hemi, added a powerglide and headed to the races to run the 7.60 nostalgia category. At 1900 lbs I expected something spectacular – well that didn’t happen. Running gasoline, it ran a best of 7.91 @ 169 mph. I’m sure the less than expected performance was mainly due to operating at a lower rpm (8000 max), 4.30 gears and a change in transmissions along with a lower launch rpm. For the 2009 California Hot Rod Reunion I switched to alcohol and didn’t see the 170’s. It ran 7.40 @ 185 on the second run. Now for the first time in my life I had to slow the car down to make the NE1 index. For the 7.60 index I’m practically running a “street” setup – 8% underdriven 6.71 at 12 lbs boost with the timing at 22 degrees. Still runs about 175 mph at sea level. I also run with the Western Fuel Altereds where we can run as fast as we can – another 100 cubes would help that effort! Check the “Race Results” drop down for my progress (or lack of). FLASH! I purchased a 511″ late model to see if I could keep up with the big boys. After two years of tuning changes my best wasn’t much better than with the early hemi (7.20 @ 188). For 2016 I decided the engine might like more rpm so switched from a 4.10 to a 4.30 gear. The result was a 6.61 @ 209.91. That’s over 20 mph from one change! If you want to run a hemi on gas, alcohol or a low percentage of nitro check out the “Tech Talk” section and I’ll tell you how to safely do it with little or no parts breakage. I’m talking racing – not street (although most applies). I have NEVER run a carburetor on a race car so don’t ask for advice in this area.